In this new column, we feature content from presenters at the 2018-2019 Philadelphia Neurological Society meetings. The Philadelphia Neurological Society (PNS) was founded in late 1883, 1 of 4 local neurologic societies in the US (Philadelphia, New York, Boston, and Chicago) founded shortly after the American Neurological Association (ANA) formed in 1875. The goal was to provide continued opportunities for interaction among physicians interested in neurology on an intimate regular basis. Charles K. Mills, W. Sinkler, J. T. Eskridge, and Francis X. Dercum were founding members, and Silas Weir Mitchell became the first president in 1884. Interestingly, Dr. Mitchell, considered by many to be the founding father of American neurology, had also been nominated as the ANA’s first president, but declined to serve until after 35 years. The PNS established a program of monthly meetings from October through April at the College of Physicians, then at 13th and Locust Streets in Philadelphia. The precedent for location and timing of meetings has continued to this very day, even as the College moved to its current location on 22nd Street. In 1887, the Society brought medicolegal issues into its purview via combined efforts with the Medical Jurisprudence Society of Philadelphia. In 1904, Charles Frazier’s involvement brought input from the neurosurgery community. A robust program in adult neurology, child neurology, neurosurgery, and neuroscience has continued since. The PNS draws upon the innovation and excellence of members of the surrounding medical institutions including the University of Pennsylvania, Thomas Jefferson University, Temple University, Drexel University, and their various affiliates. Many luminaries in neurology have served as presidents of the PNS. Mitchell, as the premier neurologist in the United States following the Civil War, established that precedent. Included among this esteemed group were William Spiller, Bernard Alpers, Nathan Schlezinger, Gabriel Schwarz, Arthur Asbury, Lewis “Bud” Rowland, Helena Riggs, and Milton Alter. More recent presidents since 1985 have included Grant Liu, Steven Galetta, Carol Lippa, Dara Jameson, and Kevin Judy. The PNS has a large of archive of historic minutes of great interest and is developing a web and social media presence for greater dissemination of its activities past and present. This publication, Practical Neurology, has had a strong relationship with the PNS since the publication’s founding in Philadelphia in 2002. 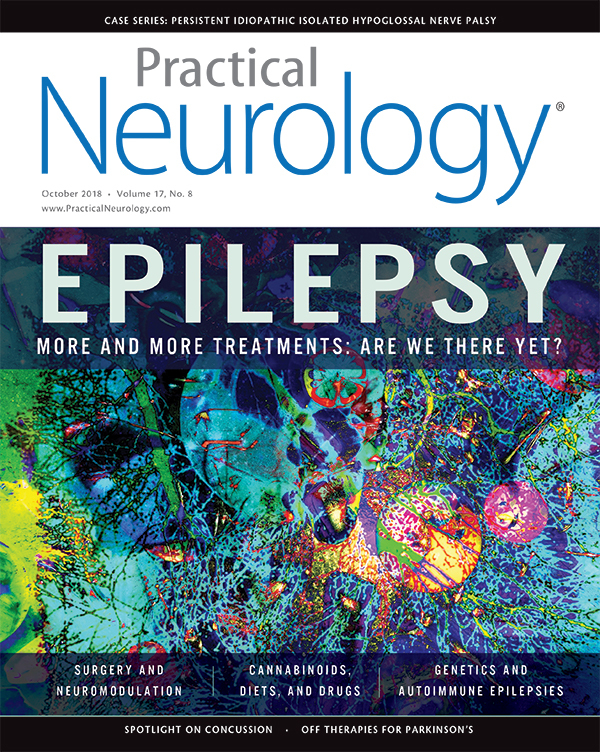 Many esteemed editorial board members received their neurology training here, or practiced in the area for a time, and have benefitted from the relationships they formed at the PNS meetings. 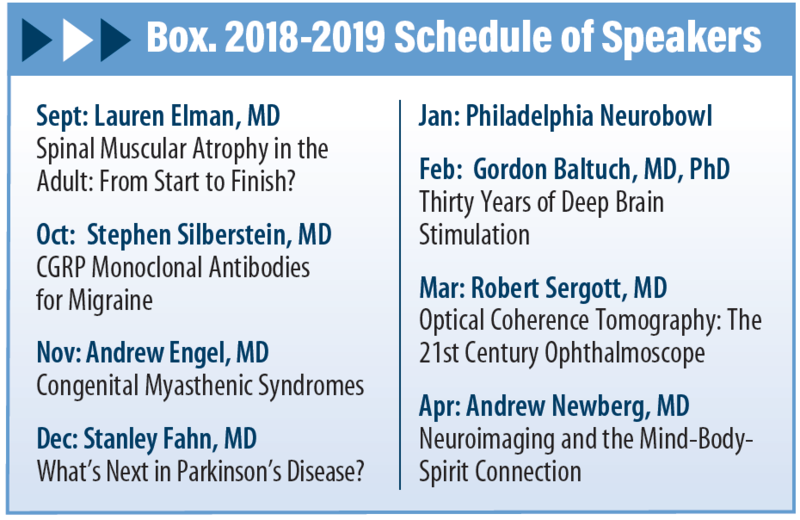 As before, the speakers and presentations planned for 2018-2019 (Box) are also of interest to neurologists outside the area. We look forward to sharing that content with you in the new Hometown Highlights column beginning with the next issue, and we welcome your feedback. A newly recognized category of epilepsy caused by or associated with antibodies. A new frontier brings new questions and old dilemmas. Neurologists need to understand the phenomenon of using psychedelic drugs for cluster-busting and advocate for appropriate research. As the number of available antiepileptic drugs increases, so does the challenge of choosing the most appropriate drug for a given patient.